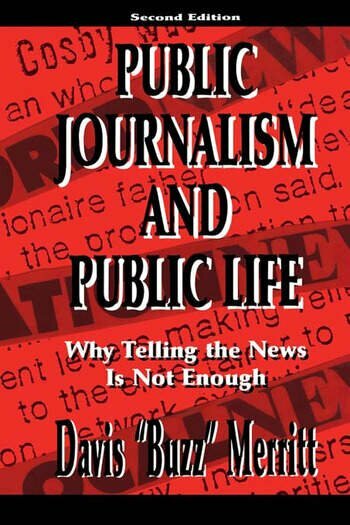 The original edition of Public Journalism and Public Life, published in 1995, was the first comprehensive argument in favor of public journalism. Designed to focus the discussion about public journalism both within and outside the profession, the book has accomplished its purpose. In the ensuing years, the debate has continued; dozens of newspapers and thousands of journalists have been experimenting with the philosophy, while others still dispute its legitimacy. This larger second edition further develops the philosophy, responds to the arguments against it, outlines how specific principles can be applied, and explains the importance of public deliberation and the role of values in public journalism. Divided into three sections, it can be used as a supplement to the first edition or as a starting point for those being newly introduced to the ideas that have been the subject of debate within the profession and among those interested and involved in civic life at all levels. Section 1 summarizes two major arguments -- why journalism and public life are inseparably bound in success or failure and why the way journalism operates in the current environment fosters failure more often than success. Section 2 looks at the evolution of the profession's culture, its impact on the author's extensive career, and how he grew to believe that substantive change is needed in journalism. Section 3 deals with the implications of public journalism philosophy -- how it requires the application of additional values to daily work, its evolution in the early years and where its current focus should be, plus various questions about the future of cyberspace. Contents: Preface to the Second Edition. Why Change? Understanding a Peculiar Culture. Learning to Not See. Soaring Toward a Crash. The Limits of Toughness. Connect and Disconnections. Making a Break. The Value of Values. The Value of Deliberation. So Far, So Good...Mostly. Some Tools and Their Uses. Cyberspace: Finding Our Way. So What's It All About?